Hours & Directions - Leber Jeweler Inc.
Leber Jeweler Inc is conveniently located in Chicago’s River North neighborhood at 303 West Erie Street. We are near bus and train lines and are easily accessible by foot, bike, or car. There is plenty of metered street parking. 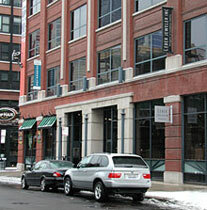 In addition, there are numerous parking lots in River North. The closest lots to our store are at the northeast corner of Erie and Orleans and at the northeast corner of Erie and Wells. For a limited time, on Saturdays ONLY you can park as our guest for one hour in the lot just to the west of our store. Directions from the Edens (14) Kennedy (90) Expressways: Take the East Ohio Street exit 50B, left onto Orleans, right onto Erie. Directions from the Eisenhower (290) Expressway: Merge onto 90/94 West Kennedy Expressway toward Wisconsin. Take the East Ohio Street exit 50B, left onto Orleans, right onto Erie. Directions from the Stevenson (55) Expressway: Merge onto 90/94 West Kennedy Expressway via exit 292A toward Wisconsin. Take the East Ohio Street exit 50B, left onto Orleans, right onto Erie. Directions from Interstates (57) (94) : Merge onto 94 West via the exit on the left toward the Chicago Loop. Take the East Ohio Street exit 50B, left onto Orleans, right onto Erie. Directions from North Lake Shore Drive: Exit at Michigan Avenue, turn right onto Chicago Avenue, left onto LaSalle Street, right onto Erie. Directions from South Lake Shore Drive: Exit at Chicago Avenue, left onto LaSalle Street, right onto Erie. Our Online store and customer service through email continue to operate while our physical store is closed. Enjoy two hours of free parking on Saturdays in our adjacent parking lot while you visit us. Appointments are advised for engagement ring and custom design consultations. Please call or email ahead, as we close for advocacy and related events.